I'm not even sure if I should call this a "spring recap" since spring was virtually nonexistent this year, at least it wasn't during the period of time it should have happened. The best way to sum up my season is probably "strikes and gutters." There were some major disappointments for sure. However, when one door closes, another door opens. I was itching to get back on the Naugatuck all winter. Last spring, I was able to fish a few times in March before the salmon season closed until opening day. The river wasn't suitable for fishing until after the April 1 closing, so that wasn't an option this season. My friend Roger and I drifted part of the river when the water was up. At least for salmon fishing, that was probably a better idea on paper than in reality. It's hard to get nice, long swings from the boat. The boat makes for great transportation though. I saw one salmon hooked that day, before we started fishing, so at least we knew there were some still around. I did a little trout fishing the next week, but I couldn't manage to get excited about it. I figured I'd give salmon fishing another shot and see how late in the spring I could catch one. There was a very brief period of time when conditions were just right. The river was at a decent level, dropping nicely, clear and 58ºF. I was able to fish the evening of April 29. I didn't have a lot of time, so I had to fish each spot quickly. The third hole was the one I was most confident about. A friend had caught a few in that area the week before. 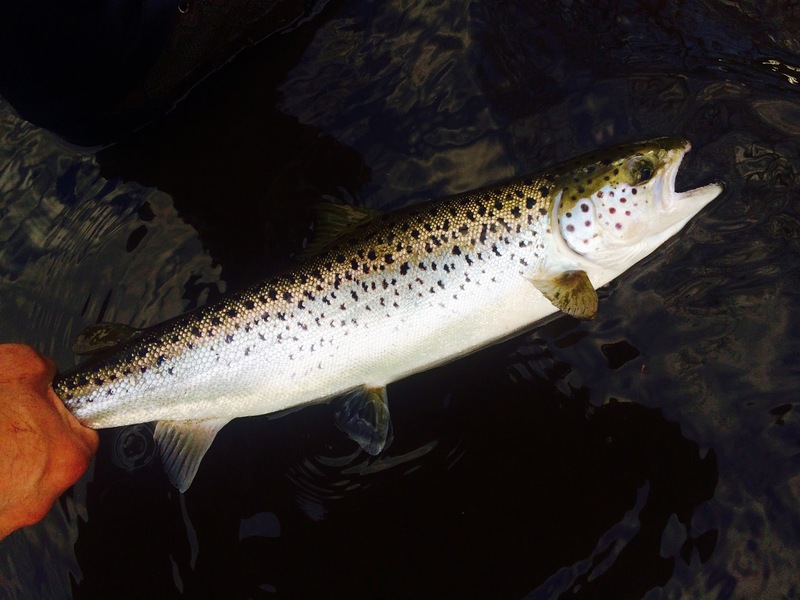 The first pass through the run yielded a small, but handsome, salmon. The fish took a sz. 2 Sugerman Shrimp, fished on a floating Scandi head and hover/intermediate polyleader. I thought I would be able to catch salmon into May, but a lack of rain must have made the stragglers dour and reluctant to take a fly. The water didn't come up again until June, so that was the end of that. Regardless, I've never caught a broodstock salmon as late as I did this year, so I was happy about that. There's not much to report here. This "season" was a huge bust at my favorite spring river. I say "season" because what usually lasts about 6-8 weeks took place in about 8-10 days this year. I was there on day one, but got skunked. My friend caught a couple of schoolie sized bass, however. I missed the next 8 days and then it was all over. 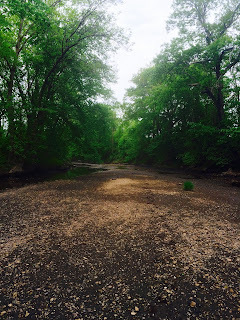 Since we got no rain and summer temperatures throughout May, the river was a trickle during what should have been the best part of the season. 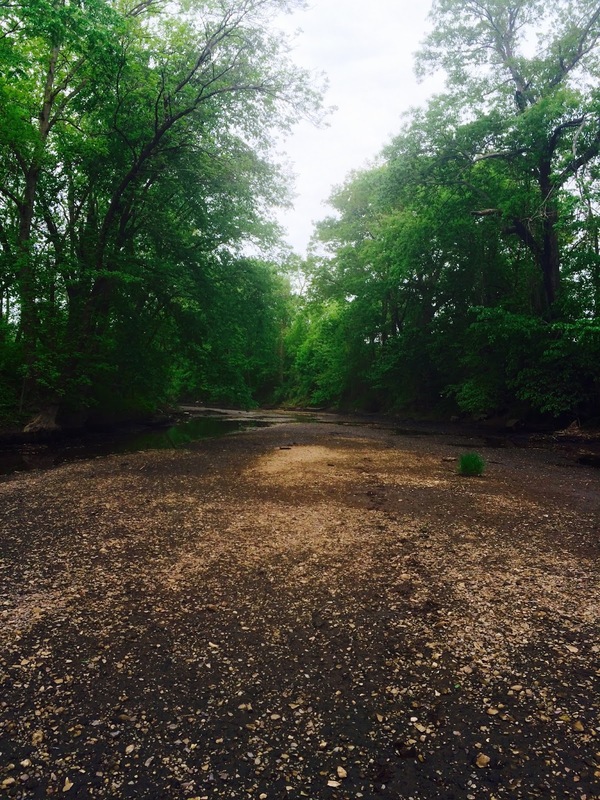 The river bounced back with the heavy rain at the beginning of June, but it was too late. I fished ideal conditions (in terms of water level, temperature and "normal" timing), but only caught smallmouth bass. There were no stripers, trout, or bait to be found. Just because I rolled snake eyes doesn't mean that everyone else did. A friend of mine landed a nice 6.5lb sea run brown and caught several stripers. I heard of two other large trout caught by spin fishermen, but those reports weren't confirmed. Even in bad years, a few people are still going to have good timing. What a drag...I waited all winter for this. I'll probably go catch some stripers elsewhere this summer, but nothing can beat fishing them in a place where just about anything could be on the end of the line. It could be a bass, a large trout, or...??? The mystery is the most exciting part. This spring wasn't all doom and gloom. This was my first season fishing for American shad. 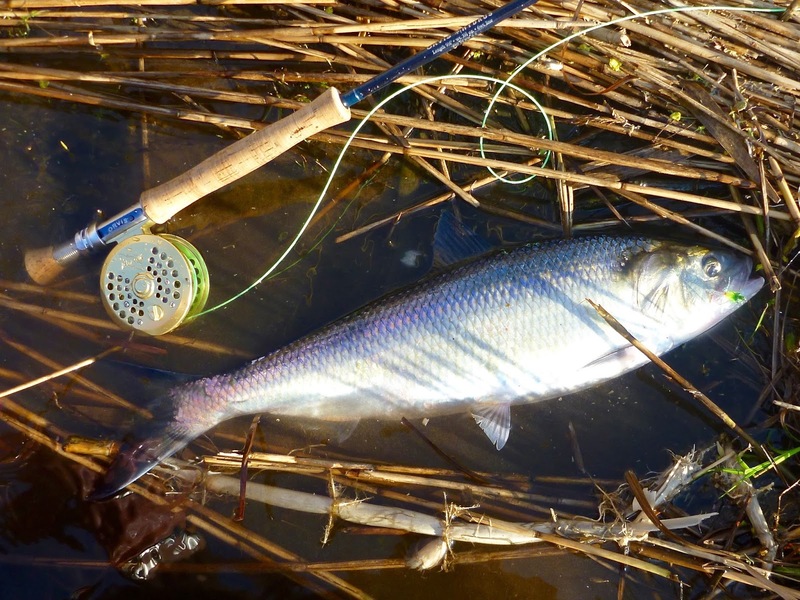 What made for a terrible season at the striper/sea trout river made for a pretty good season of shad fishing. 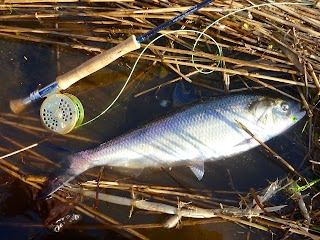 The water was low and the shad had little trouble ascending the river. They seem to be active at a wider range of temperatures than other local anadromous species. Of course, there way more shad than anything else, so maybe that has something to do with it. There was a bit of a learning curve I had to deal with before I started putting up decent numbers of shad. I expected it to be more like Atlantic salmon fishing than it actually was, so my mental hangups were probably responsible for my limited success in the first two trips. I got skunked the first trip, but landed one on the next. I landed several on the third trip, and then into double digits just about every trip thereafter. I figure it took three trips to fully shake off my preconceptions. I went through this when making the jump from trout fishing to Atlantic salmon fishing, so it was a lot easier to identify and correct this time around. Another thing that helped was going with my gut instincts and breaking away from the crowd. Though there are many differences between shad fishing and salmon fishing, there were enough similarities to reward some hunches that I had. I erased the salmon fishing part of my brain until I was ready to accept American shad fishing for what it is, then I brought the salmon part back. It worked well and I had some very good days mid-to-late May and early June. Because shad run along the river bottom, I lost a fair amount of flies. As such, the only fly tying I've been doing lately has been for shad, mainly to replace flies I've lost. 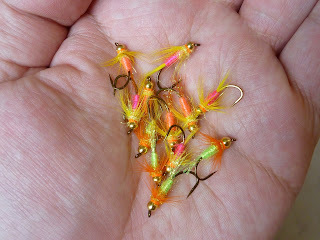 As the water dropped, I did better on small, beadhead wet flies in bright colors. I would tie a half dozen before every trip and would usually lose them all by the end of the day. Note to self: Tie lots of shad flies next winter! Shad fishing is definitely tapering off, but I'm going to keep trying until I stop catching them. What a fun fish to catch. I wish I knew about them sooner. Once I found good swinging water I was really hooked. They are great fighters for their size. I guess that should come as no surprise given their lifecycle. It's great to have another option for future spring seasons. Last year, I mentioned how I was going to try to post weekly. I actually kept up with it for a lot longer than I expected to. I probably won't get back to that pace until fall. I have some projects that will (hopefully) begin to roll out by the end of the summer, however. They should help fill in the space left by sporadic posts here.